"What happened in Woolwich yesterday has sickened us all," the prime minister said on Thursday. "The people who did this were trying to divide us. They should know something like this will only bring us together, make us stronger." Speaking outside Downing Street after a meeting of the government's Cobra crisis committee, Cameron described the attack as a betrayal of Islam, adding that it was "solely and purely" the responsibility of the individuals involved. "This view is shared by every community in our country," he said. "This was not just an attack on Britain and on the British way of life; it was also a betrayal of Islam and of the Muslim communities who give so much to our country. "There is nothing in Islam that justifies this truly dreadful act." This is either a deliberately misleading speech the Prime Minister of England gave the other day, or the most ignorant one he could cobble together. First, as a good friend succinctly said when he first heard this statement - No! They are not trying to "divide" you, they are trying to KILL you! Second, the idea that "nothing in Islam that justifies this truly dreadful act" is completely a false statement. One of the murderers, with a meat cleaver still in his hand, quotes from the Quran itself for the reasons he cut this young soldier down. “By Allah if I saw your mother today with a buggy I would help her up the stairs. This is my nature. But we are forced by the Koran, in Sura At-Tawba, through many ayah in the Qur’an, we must fight them as they fight us. An eye for an eye, a tooth for a tooth. He is at war with the West for being at war with terrorists. The problem is truly Islam. The more religious a Muslim is, the more dangerous he seems to become. Let's look at recent history. The man with the meat cleaver, Michael Adebolajo, who murdered Lee Rigby, was a Muslim convert. The Boston Marathon bombers were religious Muslims. Tamerlan Tsarnaev, became more devout over time and returned to Russia to gain training to help him with his jihad. Dzhokhar, his brother, believes that an attack on one Muslim is an attack on all and called his brother a "martyr". Three days after the attack on the British soldier, another Muslim convert attacked a French soldier with a knife after praying in Muslim style. The French believe it was "religious ideology" that drove him. I'm shocked. This is nothing new. We've seen this time and again. However, we've never seen secular Muslims attacking anyone in the name of Allah. We've never seen secular Muslims calling for jihad against the infidels. We do hear the battle cry of "Allah Akbar" when an attack by a religious Muslim is about to occur - not something less innocuous like 'I hate you'. We've moved on from organized jihad - to a "do it yourself" kind. Does it make it any less dangerous? Absolutely not. In many ways it becomes more dangerous, more difficult to monitor. Any religious Muslim can feel that it's a good day to kill an infidel, and there's not much to be done about it. The Quran is made up of different chapters. The earlier chapters seem to be peaceful, the later ones more war-like. What needs to be understood is that the later chapters supersede the earlier ones. The earlier peaceful ones no longer apply. This is a religion at war with others. For any leader - Cameron included - to ignore the danger of religious Islam is either to mislead the public, or is sticking his head in the sand and hoping for the dangers to go away. I'll give him the benefit of the doubt that he is looking for some sand. Just a couple of great links to help everyone commemorate Memorial Day and remember all those brave men and women who have fallen protecting our freedoms at home and liberating millions of others around the world. Photo Essay: Veterans Day Parade NYC 2009 by Urban Infidel ***fantastic! What If G.W.Bush Were President? I am not a fan of Glenn Beck, but this story is ridiculous. Rather than report the news, reporters would rather create the news. When you read these next two stories, ask yourself - What if George W. Bush were president? Can you imagine the media going out of their way to protect him after four Americans were murdered on his watch? His administration? Even the IRS story - imagine it taking place during President Bush's term of office - how quickly would this become a major scandal? Rather, the White House reaction (and consequently the media's reaction) is a disinterested eh, who cares. 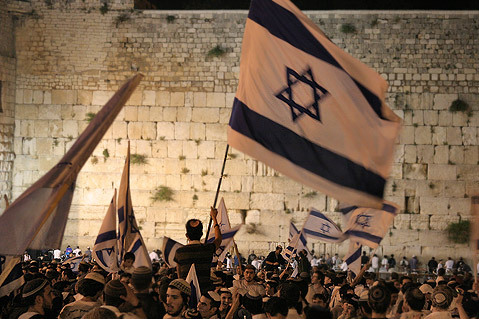 Today is Jerusalem Day, celebrating 46 years of the liberation of Jerusalem. We take for granted the accessibility of our only holy place - the Kotel, the Western Wall - but we must not forget that for 19 long years (1948-1967) we were completely without that access... and the World didn't care. I am not a creature from another planet, as you seem to believe. I am a Jerusalemite – like yourselves, a man of flesh and blood. I am a citizen of my city, an integral part of my people. I have a few things to get off my chest. Because I am not a diplomat, I do not have to mince words. I do not have to please you, or even persuade you. I owe you nothing. You did not build this city; you do not live in it; you did not defend it when they came to destroy it. And we will be damned if we will let you take it away. There was a Jerusalem before there was a New York. When Berlin, Moscow, London and Paris were miasmal forest and swamp, there was a thriving Jewish community here. It gave something to the world which you nations have rejected ever since you established yourselves – a humane moral code. Here the prophets walked, their words flashing like forked lightning. Here a people who wanted nothing more than to be left alone, fought off waves of heathen would-be conquerors, bled and died on the battlements, hurled themselves into the flames of their burning Temple rather than surrender; and when finally overwhelmed by sheer numbers and led away into captivity, swore that before they forgot Jerusalem, they would see their tongues cleave to their palates, their right arm wither. On every Yom Kippur and Passover we fervently voiced the hope that next year would find us in Jerusalem. Your inquisitions, pogroms, expulsions, the ghettos into which you jammed us, your forced baptisms, your quota systems, your genteel anti-Semitism, and the final unspeakable horror, the Holocaust (and worse, your terrifying disinterest in it) – all these have not broken us. They may have sapped what little moral strength you still possessed, but they forged us into steel. Do you think that you can break us now after all we have been through? Do you really believe that after Dachau and Auschwitz we are frightened by your threats of blockades and sanctions? We have been to Hell and back – a Hell of your making. What more could you possibly have in your arsenal that could scare us? I have watched this city bombarded twice by nations calling themselves civilized. In 1948, while you looked on apathetically, I saw women and children blown to smithereens, this after we had agreed to your request to internationalize the city. It was a deadly combination that did the job: British officers, Arab gunners and American-made cannon. And then the savage sacking of the Old City: the willful slaughter, the wanton destruction of every synagogue and religious school; the desecration of Jewish cemeteries; the sale by a ghoulish government of tombstones for building materials for poultry runs, army camps – even latrines. And you never said a word. You never breathed the slightest protest when the Jordanians shut off the holiest of our holy places, the Western Wall, in violation of the pledges they had made after the war – a war they waged, incidentally, against a decision of the UN. Not a murmur came from you whenever the legionnaires in their spiked helmets casually opened fire upon our citizens from behind the walls. Your hearts bled when Berlin came under siege. You rushed your airlift “to save the gallant Berliners.” But you did not send one ounce of food when Jews starved in besieged Jerusalem. You thundered against the wall which the East Germans ran through the middle of the German capital – but not one peep out of you about that other wall, the one that tore through the heart of Jerusalem. And when the same thing happened 20 years later, and the Arabs unleashed a savage, unprovoked bombardment of the Holy City again, did any of you do anything? The only time you came to life was when the city was at last re-united. Then you wrung your hands and spoke loftily of “justice” and the need for the “Christian” quality of turning the other cheek. The truth is – and you know it deep inside your gut – you would prefer the city to be destroyed rather than have it governed by Jews. No matter how diplomatically you phrase it, the age old prejudices seep out of every word. If our return to the city has tied your theology in knots, perhaps you had better re-examine you catechisms. After what we have been through, we are not passively going to accommodate ourselves to the twisted idea that we are to suffer eternal homelessness until we accept your Savior. For the first time since the year 70 there is now complete religious freedom for all in Jerusalem. For the first time since the Romans put the torch to the Temple everyone has equal rights. (You preferred to have some more equal than others.) We loathe the sword – but it was you who forced us to take it up. We crave peace – but we are not going back to the peace of 1948 as you would like us to. We are home. It has a lovely sound for a nation you have willed to wonder over the face of the globe. We are not leaving. We have redeemed the pledge made by our forefathers: Jerusalem is being rebuilt. Next year – and the year after, and after, and after, until the end of time – in Jerusalem! There's a problem. There is a shortage of ammunition out there - and the ammunition that can be found has a higher price tag. Senators Jim Inhofe and Representative Frank Lukas have thankfully noticed. Oklahoma Sen. Jim Inhofe and Rep. Frank Lucas have introduced a bill that would prohibit every government agency — except the military — from buying more ammunition each month, than the monthly average it purchased from 2001 to 2009. The lawmakers say the Obama administration is buying up exceedingly high levels of ammunition in an attempt to limit the number of bullets the American public have access to on the open marketplace. "President Obama has been adamant about curbing law-abiding Americans’ access and opportunities to exercise their Second Amendment rights," said Inhofe. It's a bit crazy. 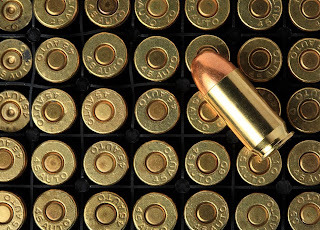 Homeland Security (not the military) has bought 1.6 billion rounds of ammunition. A Forbes article puts that into perspective. ... at the height of the Iraq War the Army was expending less than 6 million rounds a month. Therefore 1.6 billion rounds would be enough to sustain a hot war for 20+ years. In America. Somebody needs to explain this. Democrats and even the National Rifle Association are denying "conspiracies" by the Obama administration. Sure, I'm not one who thinks the government is out to get me every day -- but these huge buys of ammunition need to be explained, especially when the store shelves are empty and civilians can't buy a box for their own use. DHS Seeks Millions More Rounds of Ammunition - what's up with this?